FFWPU Europe: Recently, the cooperation with Catholic institutions, developed substantially. The WFWP president Elisabetta Nistri received an award for supporting the integration between Immigrants and Italians, by the “GOLDEN FORTUNE ”Academy. The ceremony was held in one of the three main churches in Rome “Santa Maria Maggiore” and the award was given by the Bishop of the church together with other people receiving the same award included an Italian parliamentarian, a University director and other dignitaries. Going back to the conference, the hall that was offered by the Dean Alejandro Crosthwaite, is in the university were the late Pope John Paul the second studied and the hall itself is the one were he gave the final examination to graduate. It is a very meaningful and historical place for all Catholics. The program was endangered by a national general strike that blocked all transportations for the full day and we were tempted to decide to cancel it until the last moment. Finally we decided to keep it and go ahead and it was really a very good decision. The number of the participants was affected by the strike, but all the main people came, plus very qualified participants that had to walk a long way to reach the University. It shows the level of commitment of all the people that finally attended the conference, that corresponded to a very high spirit in which all the conference was immersed. The Dean himself spoke first, after an introduction to the topic by Carlo Zonato, UPF Italy president. After he had to leave to go to the Vatican to meet directly with the Pope Francesco. We asked him to send our love and greetings to the Pope himself. After him professor Bertirotti, Anthropologist, gave a speech on the Anthropology of Peace. Why peace is necessary to the human being and how we are evolving in that direction. It was an amazing paper, enlightening and very “Principled”. Then Dr. Stango, director of the Helsinki committee in Italy, spoke about the fundamental human rights as base for peace. 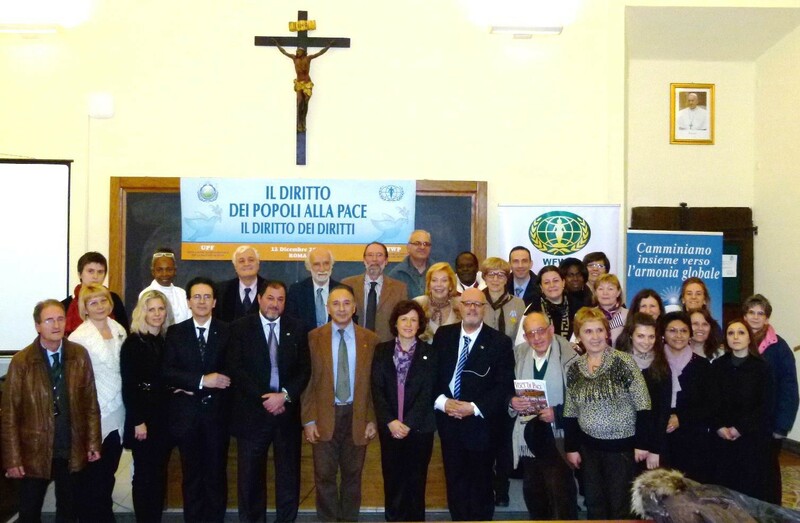 Following Giuseppe Calì, UPF Rome responsible spoke on “The necessity of the interreligious cooperation in the building of a culture of peace”, explaining how UPF is working worldwide through the interreligious dialogue and why religions are relevant in the peace processes. Two politicians from the Rome city hall spoke afterward, Pollicita and Pelliccia, working directly under the city major for immigrants and religious communities, explaining how they are working in the Rome territory to create a dialogue between the many different communities. 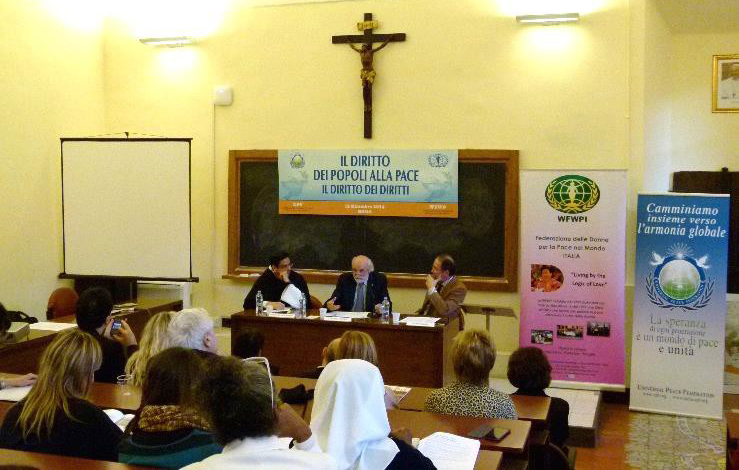 Elisabetta Nistri, presented the WFWP activities and a paper with the title” Peace and human dignity”. Finally, Lady Tereshenko, President of the Ukrainian community in Italy, presented the situation of her people as an example of self determination and fight for freedom. A long session with questions and answers followed, coordinated by Prof. Cavallaro, and Ambassador for Peace. It was a very intense session in which we could deepen our understanding on every issue that was introduced earlier. Especially appreciated was the comment by Giuseppe Calì, on the role of spiritual discipline in the peace processes and liberation of mankind from suffering. Many participants could offer their comments and all felt the desire to continue developing such an important issue in a next conference. Carlo Zonato, called finally everybody to a higher level of commitment and cooperation with UPF and WFWP, to promote world peace and bring new hope, especially in a time of crisis as the one in which we are all living, nowadays, especially in Italy. We are particularly happy about this event for several reasons. First, we could fulfil this task with strong internal determination, against the difficult circumstances due to the strike. Second, the very meaningful cooperation with such an important Catholic institution, represented by a very important representative. Third, we could start cooperation with several new outstanding “Abel type” people and organizations. We are always grateful to God and True Parents for giving us the chance to experience such a heart of hope and love, even living a life that nowadays is becoming more and more complicated for everybody. These are the very hope and love that we want to spread around us in Italy.